“Brian & Co. Parliament Square SW1”screening at William Morris Halls, Wimbledon, UK! “Brian & Co. Parliament Square SW1” will be screened at William Morris Halls, Wimbledon, UK, on 2nd February 2018. Organised by Wimbledon Disarmament Coalition/CND. For more details, click here. “A Woman From Fukushima” screening/Ms. Kida & the director’s Skype talk at SOAS University, London, UK! 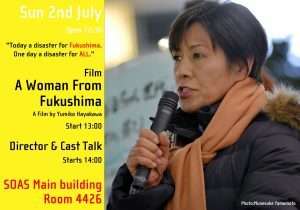 “A Woman From Fukushima” will be screened at SOAS University of London, UK, on 2nd July 2017. Ms. Setsuko Kida and the director’s Skype talk after the screening. Organised by JAN UK. For more details, click here. Petite Adventure Films in English is now open! Petite Adventure Films in English is open. We are looking forward to seeing you!